Leveraging its alignment with partners Cambridge Investment Research, Inc. and Fidelity Clearing and Custody Solutions. Cambridge Investment Research, Inc. is an independent, privately-controlled broker-dealer with over $80 billion assets under management, more than 700 home office associates, and over 3,000 independent registered representatives serving hundreds of thousands of investing clients across the United States. Cambridge is an independent broker-dealer for financial professionals striving to offer unbiased investment advice to investing clients. They are among the nation’s top independent broker-dealers and are fully devoted to four core values of integrity, commitment, flexibility and kindness. Cambridge has been honored as ‘Broker Dealer of the Year’ for 2016, 2015, 2014, 2013, 2012, 2010, 2008, 2007, and 2003 by Investment Advisor magazine; and was ranked 10th in the ‘2016 FP50 IBD Revenue Growth’ by the FinancialPlanning magazine. See their site for more information. 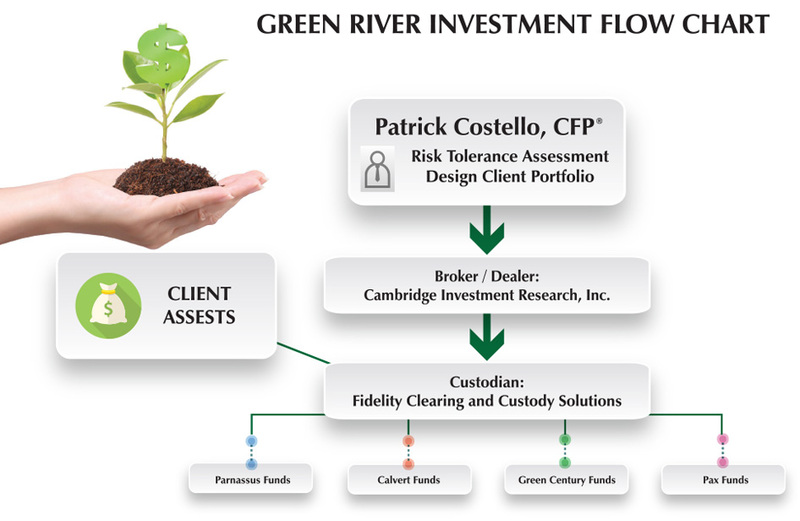 Fidelity Clearing and Custody Solutions serves as the custodian and trading platform for Green River client accounts. FCCS provides the safety and security our clients deserve. Through the Wealthport state-of-the-art trading platform, clients can access their password protected account portal, 24 hours a day, seven days a week. A history of all transactions may be accessed on this site, as well as monthly statements going back to account inception. See their site for more information. It is important to note that neither organization offers proprietary investment products. Green River upholds the Certified Financial Planner Board of Standards Fiduciary standard, always putting the client’s interest first. In particular, we avoid the conflicts of interest that can arise all too easily when affiliated with an organization that expects its employees to market proprietary investment products.